Yes I am a Sicilian-American with a dual-citizenship but becoming a TRUE Italian has been my life long mission. Well now after spending 10 years living between Florence and NY, enjoying holidays with friends from Avellino, working for tour companies and then running my own and even almost marrying a man from Naples, I can call myself an expert on the subject. With this kind of background, I thought it would be best to share with you a few pointers, so you too can feel completely immersed upon arrival! Ok, this is a harsh way to start but if you REALLY want to fit in during your first visit to Italia the first thing you need to do is ditch those stretchy pants and throw on something 'casual chic ' all the time. This mean even when grabbing that first espresso of the day. It is not like the barista will ignore your request for a cafe because of your outfit but Italian's do not think it is as cool as we do to grab a coffee all decked out in our sweaty Nike gear (although they do love Nike but just not in this case). 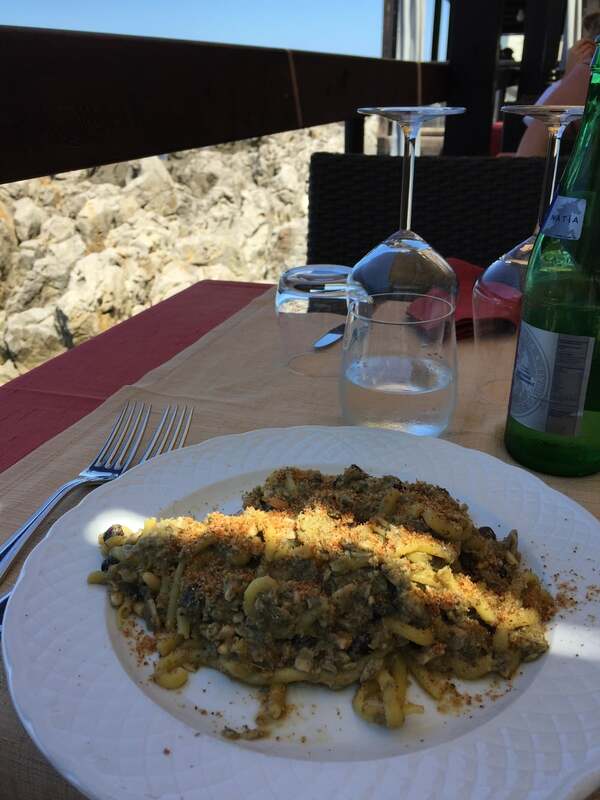 PHOTO COURTESY OF TRAVEL ITALIAN STYLE (IT'S NOT SPAGHETTI BUT IT IS PASTA CON SARDE IN SICILY..YUM)! My almost mother-in-law was the sweetest and most amazing woman I ever met but hey when she learned I was an Italian-American who couldn’t roll my spaghetti…WOOO she had to rethink if I should marry her son. Ok, you probably know this one already. Seriously people warm up to you pretty quickly in Italy if you do it right (just yesterday at the NY Times Travel Show I mentioned my family was from Sicily and I was getting kisses from all the Italians). More Tips: Basic hello's are two brushes/kisses on the cheek. However, the further north you go (think Lake Como area) the more likely you will be expected to kiss on the cheek three times! Anywhere else just do the two kiss thing. Don’t freak out as to which cheek to brush/kiss first as it will come naturally. TIP: The REAL trick is not to actually kiss the cheek but to gently put your cheek to theirs see photo above. However, it seems we all go right in for the kiss most of the time so don't sweat it either way! Don’t be surprised if your cappuccino is not steaming like the one you get from Starbucks. Italians do not like to burn their tongue during any point of their meal. So if your milk is lukewarm then this is most likely the case. QUICK TIPS: Afraid your cafe is too hot? Ask for a bicchiere d'aqua (a glass of water) prior to your coffee. Not only can you cleanse your palate to prepare for the cafe--it will also give it a minute to cool down! PS: Never ask for the water after 'taking your coffee' as this is an insult to the taste of the cafe. Italians like the cafe to linger in their mouth long after they leave the bar! B. Simply take the back of your spoon to flatten out the rice. Sounds crazy but just give it a try! 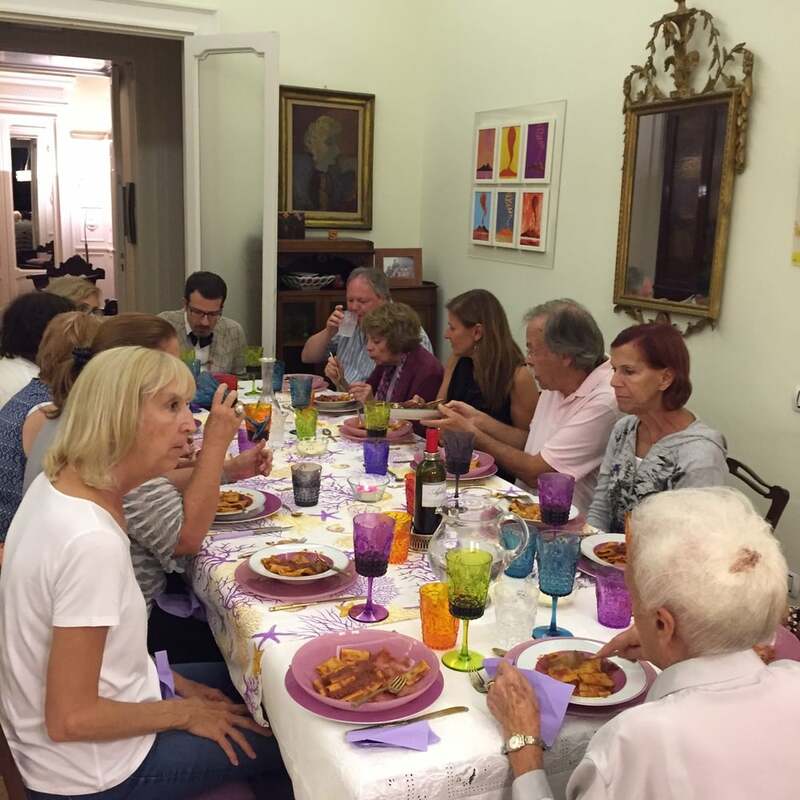 PHOTO TAKEN DURING A TRAVEL ITALIAN STYLE TOUR WHERE WE ENJOYED AN AUTHENTIC MEAL IN AN ITALIAN HOME IN NAPLES!! One thing I learned early in my childhood was if you are going to pour something for yourself be sure you ask the fabulous person sitting next to you if they would like some as well. No joke, this was taught to me at the same time as my dad was teaching me about opening the car door from the inside of the car after a man opens it for you on the outside of the car. Ok this is more of an Italian –American thing but come on guys you know you all know the Bronx Tale Car Door Test! Be polite and show your appreciation for your food/company and it will be all good! See Italians seem like they are 'dressed to the nines' all the time but that is not always the case. They are just smart about it and you should be too (if you are traveling through the country for two weeks how feasible is it to shop and bring all 20 pairs of shoes from home for everyday of the vacation??). So here is the trick, don’t stress about wearing the same shirt over and over again just throw on some layers! A nice jacket, a scarf and hell, guys you can even throw on a tie! Accessorize but do not overdo it--keep it classy and simple. MY SICILIAN GRANDPARENTS. UNTIL THE DAY MY NONNO PASSED HE WAS SEEN IN A SUIT. If you are into the name brands some highlights in Italy (although there are so many) are: Monclear Jackets (especially up north where you need those warm jackets). Anything Salvatore Ferragamo (because he is Florence) and if you really want to go all out and Don Corlelone style try Borsalino hats from Naples! PS: Join one of the Travel Italian Style shopping tours for insider info or ask about our partner's yoga and shopping weekends! PHOTO COURTESY OF TRAVEL ITALIAN STYLE DURING OUR PRIVATE COOKING CLASS ON A BOAT IN PALERMO! B. Just simply like to enjoy an aperitivo to start the digestion process before eating a meal. Dinner: 7:30ish to about 11:30ish and in Sicily maybe even 8:30-Midnight or 1am! This is the best part of learning the Italian culture and language! If you missed my past post on this, check it out! It’s a great guide to getting started! Don't feel the desire or have the time to learn some hand gestures? Just learn the basics of the language. Italians are the most interesting, fabulous and warm-hearted people you will ever know. Especially once you respect and open up to their culture! Love traveling Italy and learning to be a local? Join us on one of our upcoming Tours. Whether we are traveling through the Amalfi Coast, Sicily, Puglia or Tuscany we are traveling with guides born and raised in these towns who are constantly teaching us about the culture. An amazing once in a lifetime experience you will not want to miss! Have any comments, questions or thoughts? Comment below. 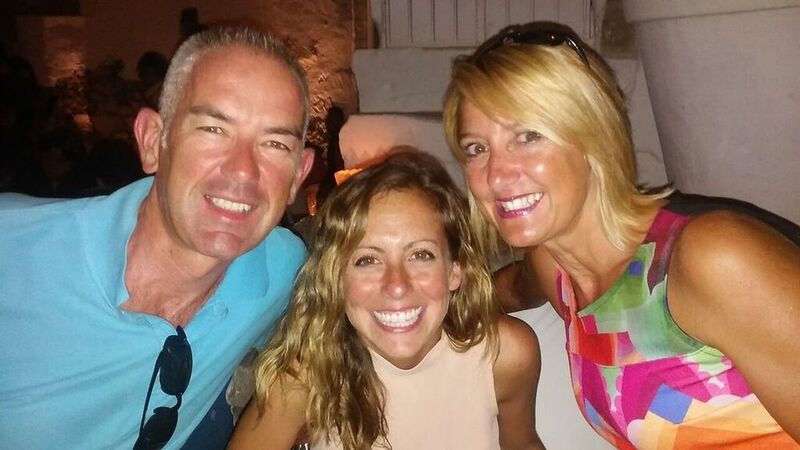 As a Sicilian-American, Italian Travel Expert Cassandra Santoro’s attachment to Italy started early. After her father’s untimely passing from cancer, she moved to Florence and found the true meaning of La Dolce Vita. Since living and working abroad, she has led countless tours, obtained her dual-citizenship and started her company, Travel Italian Style. Cassandra is known to create handcrafted tours and customized vacations for those who are passionate about their Italian heritage, dreaming of traveling Italy like a local, or looking to find themselves through travel.